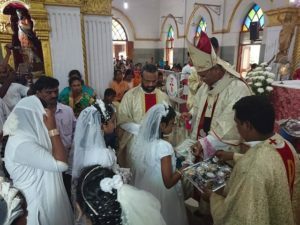 A special service called Confirmation, one of the sacraments administered to Catholics was held on Sunday, November 4 morning at Our Lady of Guidance Church ( popularly known as St Lazarus Church) in R. A. Puram. Archbishop Rev Dr George Anthonysamy led the Holy Mass celebration and administered the sacrament. Over 20 young boys and girls took part in the Confirmation service. Dressed in white clothes, they came into the church in a procession. This entry was posted on Monday, November 5th, 2018 and is filed under Religious. You can follow any responses to this entry through the RSS 2.0 feed. You can skip to the end and leave a response. Pinging is currently not allowed.